Itanagar local MLA Techi Kaso today carried out inspection to various ongoing schemes and developmental projects in Nirjuli township and interacted with locals. Earlier this morning Kaso alongwith local leaders of the township visited the Dikrong Colony, Anya Colony, Rayo Village and P Sector to take stock of ongoing CC Pavement road and interacted the locals who were waiting for the said project in their area for last one years as the said approach roads of the sector/colony were damaged in last torrential rain and the locals were facing acute problems in their day to day life since then. 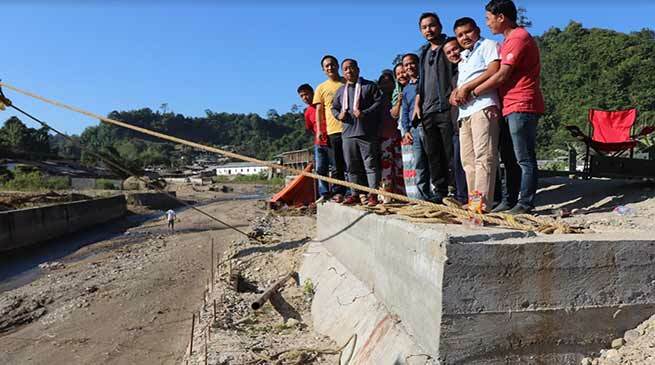 Late the team visited construction of the steel bridge launching site over river Nirjubjuli which would connect the Nirjuli Village-II. Kaso directed the officials of PWD Naharlaugn to compete the steel bridge within this month. He also requested the public to take care of the asset created in the interest of the public service. While talking to this daily Kaso said that I have given commitment for providing them the bridge and fulfil my commitment, there are some more demand of the public in the area which would be fulfilled in phase manner.